In Iran the protesters are Ali Khamenei’s enemies. He claims: The enemies are bound by money, weapons, politics and security apparatus against the Islamic order. The Iranian fascistic theocracy feeds and prides itself on having enemies. 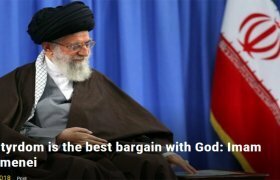 Having enemies makes the ayatollahs feel important, and the centre of the world. For them, Iran is their private property and the Iranians are there to serve them. 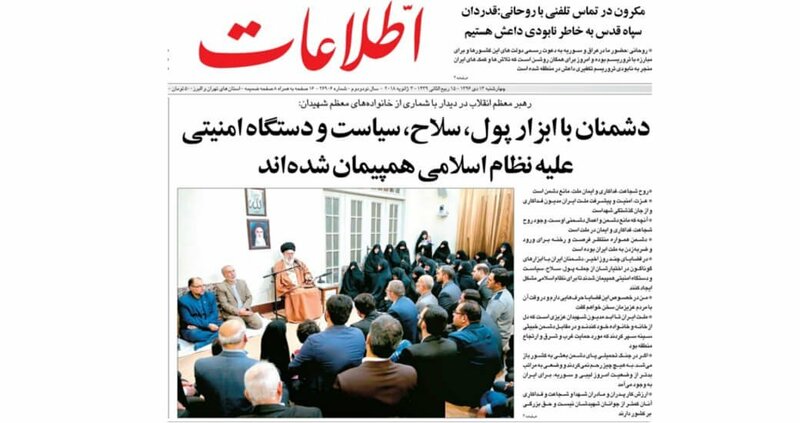 Those in Iran who are blindly religious or make money by supporting the theocracy, – tens of thousands- would not question the ayatollahs interpretations. The message chanted in pursuing the #IranProtests: Independence! Freedom! Republic of Iran! It was the first time in 40 years that a slogan was heartwarming. Note that the word Islamic is not present. Republic of Iran being claimed, even in a small amount, titillates the imagination. We have spent the past 40 years scared of the reign of arbitrariness, of Islamic interpretations, and social violence. We have adjusted and let ourselves be kept as slaves on a lead. This is true for all Iranians whether they live in the country or abroad. The spiderweb of the efficient Iranian theocracy spares no one. As it has grown and strengthened, inflation and unemployment have soared. Pollution kills and water runs out. The clerics and their siblings, the top men, are too incompetent to govern and too corrupt to care. For the past 4-5 years, the majority of people have deluded themselves in hoping that some of the candidates of the rigged elections are moderate and could bring the changes we all long for. This was the only meagre hope till 28th of December 2017. Till then no one had dared to challenge the Leader publicly. When the chanting of Death to the Leader! was heard and repeated, the magic spell of 40 years of omertà was broken: the untouchable Leader is not any more above all and law. This, however, has been a small step even if those who have broken it have paid a dear price: nearly 32 people killed and more than 3,000 jailed … and growing in numbers. Something was amiss during the protests: genuine hope, the one that feeds the change and brings clear ideas, lucidity. Genuine hope requires a creative power that did not exist. What we heard most was a desperate cry from those that naively had denied reality till then and had waited for a presumed change from above. Now the above is challenged and the Republic of Iran is a possible hope. Hope for a real change can be hatched only when we find the capacity to act together. As yet, we have had to toil and suffer for it. We have to learn how to act collectively. What gets in the way is our reflex to look back into a rosy past often far from the realities, and draw individualistic conclusions. Then we wait for a leader to materialise from the abyss and tell us what to do. Men and women of calibre do not grow on desert sand. They need determined people to share their thoughts and contribute to shaping them by their own free will and then collectively work for their aims. We are not convinced of this as yet. It is not in our culture. Protests without principles and without leaders are at best useless, like shots in the dark. They let the steam out, but prepare fertile grounds for authoritarian and fascistic movements. We already have a fascist authoritarian; no need for a new one wearing different garments. 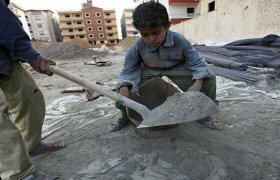 Hatching conspiracy theories and loudly heralding them are specialities in the Middle-Eastern countries. Irresponsible characteristics equally shared among the despots who run them, and sadly, the populations that compose them. 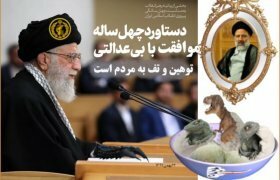 The Iranian ayatollahs excel in imagining enemies and revel in relating fables. For a day or two the Islamic despots were rattled by the desperate cries heard from many towns. 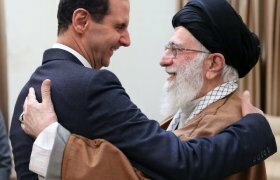 Before long, they collected themselves and rallied behind the Leader, Ali Khamenei, who has treated the protesters as enemies of Islam, traitors to the country and spies for foreign countries. The indecency of his words can only be measured with what Marie-Antoinette is believed to have said to hunger-stricken Parisians in 1789: If they don’t have bread to feed themselves on, they must eat brioches. The theocracy’s response to the street protests was to organise street shows all over the country to back the Leader with fervour. People marched together and in large numbers, carrying boards with words to show their total obedience to the Velayat-e Faqih. They chanted the slogans as were given to them by the clerics, word for word. Soon, the Leader’s followers overwhelmed the protesters and the pictures of such “magnificence and fervour” filled the media. Even if some of the pictures were out of the archive, with trees in the background as green as can be seen in spring – we are in early January – the bitter reality that protesters had lost their battle cannot be denied. The Iranian theocracy, after 40 years, is able to mobilise thousands to chant the Glories of the Islamic Revolution. They march in the street-show organised by the clerics in response to #IranProtests, carrying a board given to them. 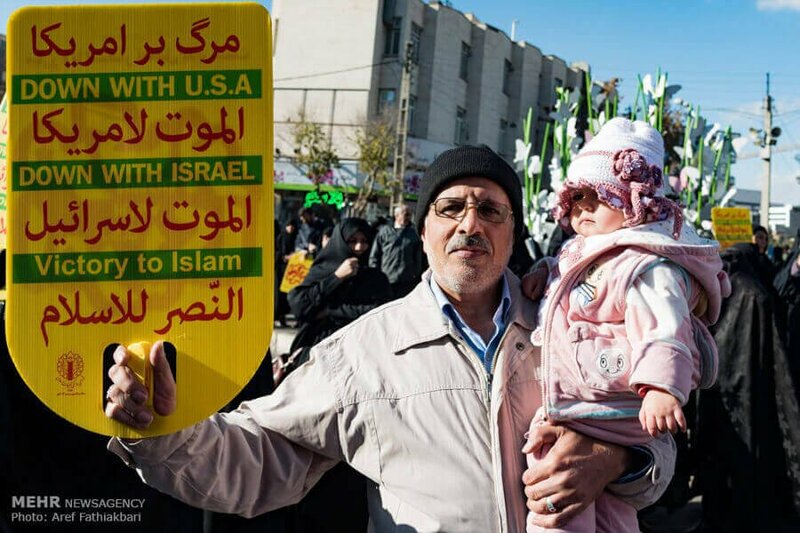 Like the man in the picture, there are tens of thousands: people that would follow blindly and unquestionably the minions of the Velayat-e Faqih. We tend to overlook this fact. We tend to minimise the strength of it and refuse to analyse it. Those who marched have the same profile of the protesters, poor, unemployed, young and old, women and men, except for the hundreds of clerics, pasdaran (IRGC) and bassijis who marched with them. This is where the poser lies: the organisational ability of mass mobilisation. The organisation of efficient street protests is an art in which the clerics excel. Bear in mind Ashura and Arba’een manifests not only in the Iranian cities but also in Iraq, by attracting thousands of “pilgrims” for the occasion from remote villages of Iran, Afghanistan and Pakistan. 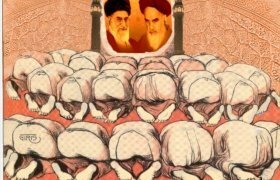 The ayatollahs have the channels to convey their messages, and over the years these have gained in efficiency thanks to the tight interlinks in the Shiite hierarchy, governmental bodies and local cells, all over the country. Their efficiency cannot be compared to social media’s. Bots and algorithms would never replace personal exchange of information and ideas. They can be useful means, if used thoughtfully and sparingly, but they are not the final product. They convey personal news, sometimes useful and positive, but often with hysteria and hate. The ayatollahs have no shame in repeating the tricks used extensively in 1978-79 to impress the passive public and the bystanders to the events, today amplified by social media. One trick is in having snipers kill some of their own people and then blame it on the other side for it. In 1978-79, a number of civilians were killed and the Shah’s regime was blamed for the murders by the Khomeinists. In today’s Middle-Eastern context of instability, they would not raise an eyebrow when ordering the use of unmarked firearms to kill some civilians and then blaming it on foreign armed terrorists. It is not a handful of spontaneous protesters that can avoid this trap. Structures are needed to safeguard them. Another trick is the wrecking of the public offices and the urban facilities by their own agents, which opens the gates to warning the public of vandals. The improbable inquiries into vandalism and street killings would never be based on fact finding and the pursuit of justice: the party who can shout louder and has the upper hand wins the verdict. The romanticism that spontaneous street protests sparks in our minds and the false power of social media have lulled us. 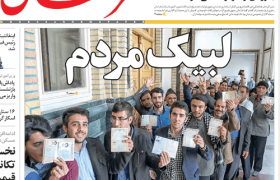 In the West, we feel good in echoing the #IranProtests news. However, there is no echo of what can replace the Islamic dictatorship and how to cut the long arms of the political Islam octopus. The triumph of Islamic Revolution was built on the idea that ordinary people could face the mighty and win. Presently, we need to revive the very same idea against the regime itself. The duty of all Iranians, wherever they are, is to protect and support #IranProtests and fight the Velayat-e Faqih with realism, pragmatism and determination.